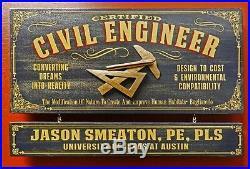 Personalized CIVIL ENGINEER Vintage Wood Plank Sign. Perfect for Office, Home, Man Cave, or as a Gift. Personalized Pop Art vintage wooden plank sign with sculpted relief. Handcrafted in Charleston, South Carolina of furniture grade wood planks and professionally printed using proprietary Poly-Arch Lithography. Each sign art piece is individually made upon order. From cutting and preparing the plank, to painting, screening, hand lettering, and distressing, each is a unique piece of art. The sculpted relief is made entirely in-house by staff artisans. Hanging hardware is included for mounting. This piece was created by the legendary designer Derek Dietzen. Size: 23.75" x 13.5" x 3. PLEASE READ ALL OF THE FOLLOWING IMPORTANT INFORMATION. Please check your messages often! If you do not answer your messages, we may have to cancel your order. Changes cannot be made to an order once it has been received and after we discuss engraving via emails. The item "Personalized CIVIL ENGINEER Vintage Wood Plank Sign, Office, Home, Man Cave Gift" is in sale since Monday, October 10, 2016. This item is in the category "Home & Garden\Home Décor\Plaques & Signs". The seller is "lkgifts" and is located in Virginia. This item can be shipped to United States, Canada, United Kingdom, Denmark, Romania, Slovakia, Bulgaria, Czech republic, Finland, Hungary, Latvia, Lithuania, Malta, Estonia, Australia, Greece, Portugal, Cyprus, Slovenia, Japan, China, Sweden, South Korea, Indonesia, Taiwan, South africa, Thailand, Belgium, France, Hong Kong, Ireland, Netherlands, Poland, Spain, Italy, Germany, Austria, Mexico, New Zealand, Philippines, Singapore, Switzerland, Norway, Ukraine, Croatia, Malaysia, Brazil, Chile, Colombia, Costa rica, Dominican republic, Panama, Trinidad and tobago, Guatemala, El salvador, Honduras, Jamaica, Bahamas, Viet nam, Uruguay, Aruba, Belize, Dominica, Grenada, Saint lucia, Turks and caicos islands, Barbados, Bermuda, Brunei darussalam, Bolivia, Ecuador, Egypt, Iceland, Cayman islands, Sri lanka, Luxembourg, Monaco, Macao, Maldives, Nicaragua, Peru, Paraguay.